Tails-a-wag'n, based in North Bergen, New Jersey, specializes in dog grooming. Our dog groomer has the skills and expertise to make your dog beautiful. Parasites, fleas, or ticks may hide within your dog's fur. Keeping your dog's fur, nails, and ears clean will help your dog to stay healthier. 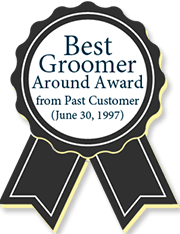 Our dog groomer has the expertise to groom almost any breed of dog, and according to the cut you desire. We offer personalized services for your furry friend. Tell us the style you want for your dog and we will adhere to your wishes. I started this business 35 years ago after attending the New York School of Dog Grooming. I am a dog lover and really enjoy working with them. It has been a pleasure serving the area for so many years and I am happy to welcome all customers new and returning. I know how important your dog is to you and your family and I will take great care with them. All grooming products used on your best friend are natural products, free of chemicals to ensure a healthy and happy pet. We have the experience and expertise to groom almost any breed of dog. Whether your four-legged friend is a pug or a larger breed, trust us to groom your dog according to your desire.